In between pulling all-nighters goofing off doing college homework and trying to stay marginally sane and/or healthy, I’ve been doing some more research into the cards. This time, I was a bit more invasive with my approach. 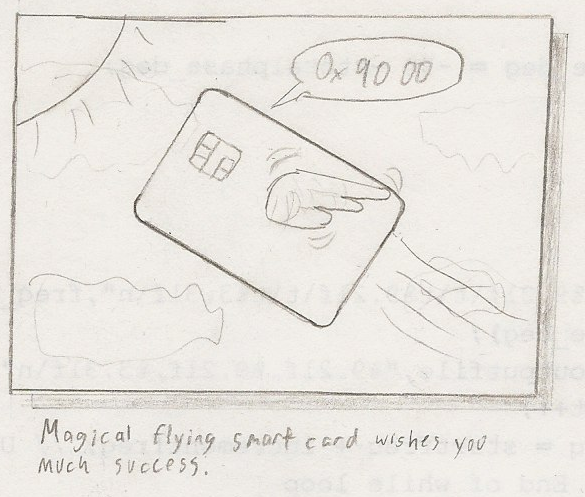 However, I’ve found out a bit more about the card’s brains this way. I’ve torn open one of the cards and taken a peek inside. The chip itself is a bit different in that the epoxy backing is molded much like a regular chip as opposed to the drop of epoxy used in many newer cards. The chip itself is pretty big, at 6mm x 4mm and with 0.1 mm thickness; the center gold pad is the entire area of the card. There are many methods of getting the plastic off of a chip, and the more professional labs use fuming nitric acid (very nasty stuff) but one easy way to do so at home is using a blowtorch to burn the epoxy and simply chip it off with a toothpick. If it’s burnt thoroughly enough, the epoxy will just fall off the chip, revealing the pretty silicon underneath. I used a small butane torch to heat up the chip, which was done outside and on a piece of ceramic tile (safety first! :)) After a bit of picking at the chip, I was able to see the inner workings of the smart card’s chip. I see 4 large blocks on the die but can’t tell much more without a microscope, and a 10x jewelry loupe only goes so far. My best guess is that the 4 blocks encompass the CPU, RAM, program ROM and maybe some EEPROM storage. There’s 14 pads on the chip; 5 pins are used for the contacts, maybe 2-3 for the radio interface, and the others might be for factory testing or programming but it’s speculation at best.